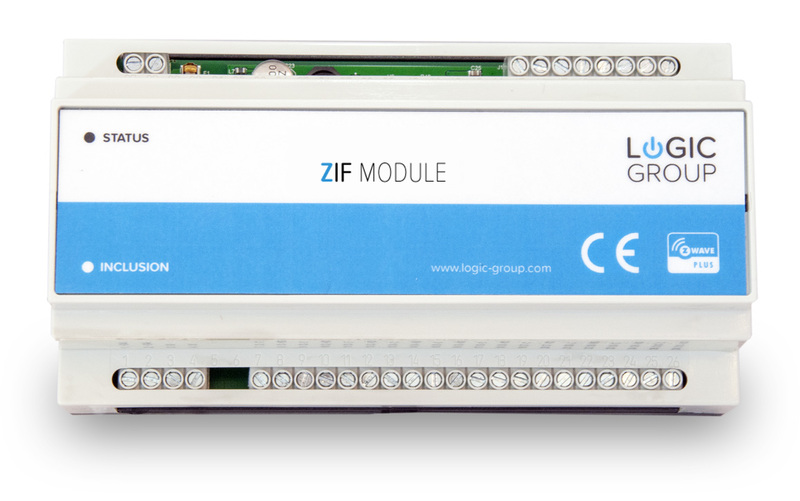 ZIF5030 is a Z-Wave based module with 10 Normally Open relay outputs and 4 analogue/digital inputs for mounting on a M36 DIN rail (EN50022). The 10 relay outputs can be freely controlled from the Z-Wave network and used for several purposes. The 4 inputs are very flexible and can be configured to function as either digital or analogue inputs. When the inputs are configured as digital inputs, they can be used for connecting potential free contacts, open collector outputs or S0 interfaces (DIN 43864). When the inputs are configured as analogue inputs, they can be used for several purposes, as the input stage is designed very flexible. E.g. the inputs are suitable for active 0..10V signals, or measuring resistor values from simple temperature sensors (PT1000/NTC). ZIF5030 is supplied from the 230V AC mains supply, and has an 24V DC output connection that can be used to be looped in to, and then switched, by the relay contacts.